A day late as I was feeling under the weather yesterday. The numbers this week are slightly higher for having been a day late, but they are even higher than that could account for because of other factors. With the recent addition of a deputy to our lineup, and with the return of our tattle-bot informing us of any single account getting more than 1 $upvote command aimed at it inside a cool-down, we were able to catch many more people this week. This leaves our count at 12247 Members after the prune. 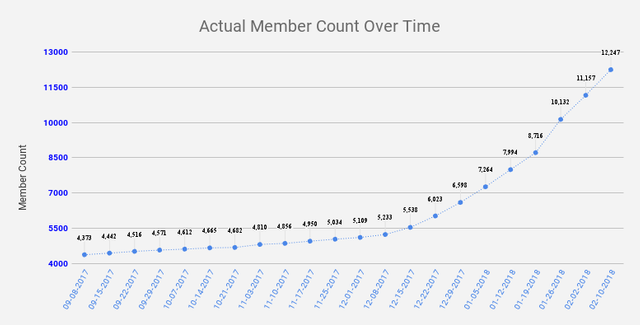 This shows the trend of members gained over time. I use the number of users counted after each purge each week. 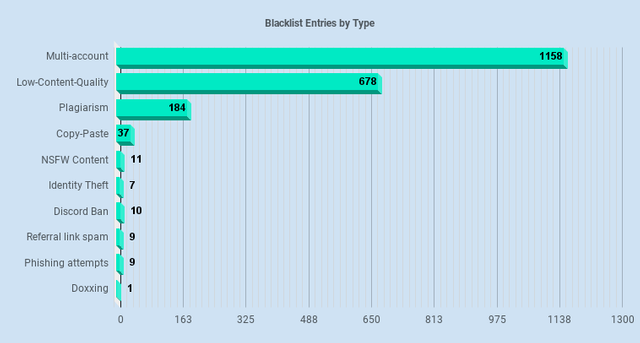 This gives a breakdown of the major categories we list an account under in our Blacklist. The increases to bans and blacklists was impressive. I feel we got a great handle on some back-log of Multi-account violations and really got started in on the content issues. As the bot struggled for a couple of cycles and needed a couple rest periods, we are really looking at a way to maximize the value to those that deserve the vote. We will be continuing these efforts going forward and will only get more efficient at them. A single image or even multiple images, with very little text or only a basic bit of information with it. An embedded YouTube or DTube video with zero additions to the post that provide value. Attempting to gain multiple upvotes outside our 1 per 24 hour cool-down by any means. Not all of these result in a ban from Discord since we want you to learn and improve. Back on track for a secure and fair free-upvote service. 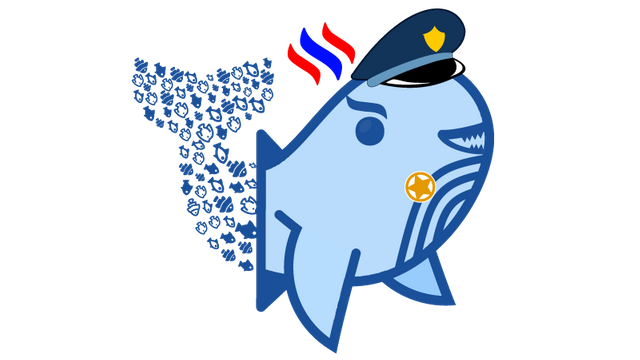 Police-style whale image is a modified version of the MSP Logo by @maliceredAll images used fall under CCO License unless otherwise specified, or they are created by the author and released under the same license. In all honesty, I came for the upvote bot. I stay for the community. Well, that and the witty repartee on Saturday afternoon. That is a lot of new members. If things keep going at this pace, about how many users can we expect by the end of 2018, in your opinion? Really hard to guess, as the trend on that graph would indicate 10's of thousands. Not sure our primary drive for new members (the upvote bot) can sustain that kind of voting level though. Ideally, we will have methods to deal with this before it becomes an issue though. That was going to be my next question. It's a good problem to have, having so many people wanting to be a part of the service, but the overload on the system and the people running it will be immense. What are the current ideas being floated for how to address this before it becomes a problem? Some have already been put in place, with an updated bot running the upvotes on Discord which allows us finer control than we had before. As well as the recent increase in our filtering and content quality checking. It helps to curb the spam and inflation in the voting for the most part. We increased the cool-down per user to 24 hours. We turn off the upvotes for 1-2 days every 3-4 days as VP dictates to let it rest. We are waiting on a fix for the algorithm for vote weight % to be fixed (currently it doesn't scale well below 1% votes). That combined with increased SP delegation to the @minnowsupport account (allowing us to lower it from 0.5% and still provide some value) will be a huge part of the fix. Beyond that, we are not sure. We will determine more methods as we get closer to an issue. It's just a game of approach a problem, determine the solution, fix it for the time-being, and move to the next one. Let's continue to mold character amid such explosive growth!! Hopefully we won't lose ourselves to too-big-to-fail... I feel the strongest connection to MSP than any group I have ever encountered! I can't wait to dive in... Roll up my sleeves and overperform!!! This was good information. Thank you! The "breakdown of the major categories," on the "Blacklist Counts by Type", made me wonder how many of those "infractions" can be done "inadvertently" as opposed to deliberate acts of malintent. You see, I am an excited-to-be-here Newbie! I am always nervous that in sometimes blinding excitement, I might "step" somewhere I shouldn't. If that should ever happen, it will always be "undeliberate", I can assure you! Meanwhile, I am devouring as much information as I can! Much to my dismay and excitement, I am finding the more I am learning, the more I am learning how much I have to learn! So, I can only hope if I inadvertently "breach", the amazing, generous and constructive support I have experienced thus far from the Minnow Support Project and Discord, will continue! Special shout out to @davemccoy for his "learn-it-by-doing-it" attitude, teaching me how to "do the system". Huge appreciation for @goldendawne for her incredibly concise guidelines and responses to many questions! Thank you again for this post! Resteeming! Thanks for sharing these.i hope things get better. 12k and strong! thank you disco for all your behind the scene work!